Cornell subsidizes annual memberships for students, faculty, and staff! Please note that the one-time $40 application fee always applies. Cornell does not offer discounts on monthly plans, so you must select the annual plan when applying to be eligible for the discount. We charge for both time and distance on each trip. Tax is not included in the rates listed above. 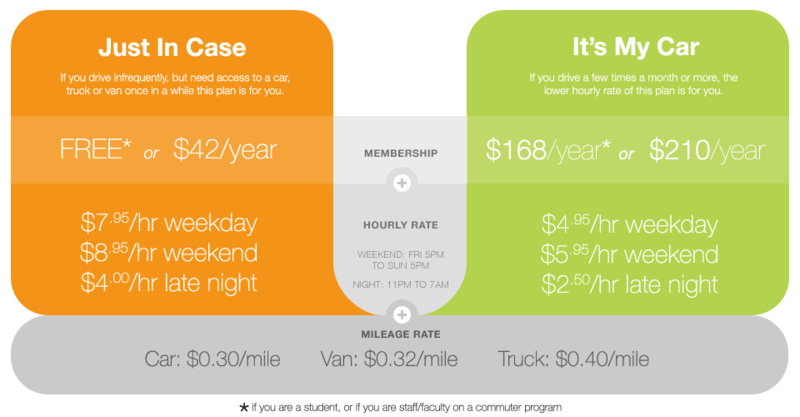 Driving between the hours of 11pm and 7am is half off your regular hourly rate. If your trip crosses 11 pm or 7 am, only the late night hours are cheaper. Most vehicles can be booked for full days at a reduced rate. Cars in our highest demand locations do not get the full day rate. The full day rate caps hourly charges at 10 hours in any 24 hour period. For trips over 24 hours, additional hourly or daily rates will be added as needed. For example, a 26 hour trip is one day plus 2 hours. Note that if any portion of your trip falls into the weekend time (Friday 5pm to Sunday 5pm) then the weekend day rates apply. We charge for both time and distance on each trip. Your card on file will be charged the exact amount of the trip (hours, distance, taxes and any fees) 5 days after your trip. You’ll also receive a monthly invoice which contains your membership fee (if applicable) and any fees not yet charged to your card. We do invoices in the first week of the month for the previous calendar month. You’ll get an email when they’re done (or a hard copy in the mail if you ask for it). If you don’t have a credit or debit card on file, you must pre-pay for trips. Each Ithaca Carshare car supports about 60 members.